As part of Newcastle Museum’s program to commemorate the centenary of the First World War I will be giving an illustrated talk about the war service of Matron Ida Greaves RRC. Where: Newcastle Museum, Workshop Way, Honeysuckle NSW. Sandwiched between Civic Station and the waterfront, the Museum is difficult to miss. Parking: Metered parking in Wright Lane, next to the Museum. Lee Wharf Car Park on Honeysuckle Drive (near Honeysuckle Hotel) is a 2-3 minute walk, and the last time I looked was free at weekends. Public transport: Get off the train at Civic Station. Entrance to the Museum is just outside the platform exit coming from the Sydney direction. Alternatively get off the bus at Civic Station, cross the line via overhead bridge or walk around to the level crossing in Merewether Street. For more information on the Museum’s WW1 program Click here and scroll down to download the flyer. This entry was posted in Australia, Awards, Great War - First World War - 1914-1919, History, military nursing, Newcastle N.S.W., Women and tagged Australian Voluntary Hospital, centenary of First World War, Christine Bramble, Matron Ida Greaves, Newcastle Hospital, Royal Red Cross on 30/07/2014 by Great War Nurses from Newcastle & the Hunter Region. Was Australia’s longest serving recruit of the Great War in fact a woman? 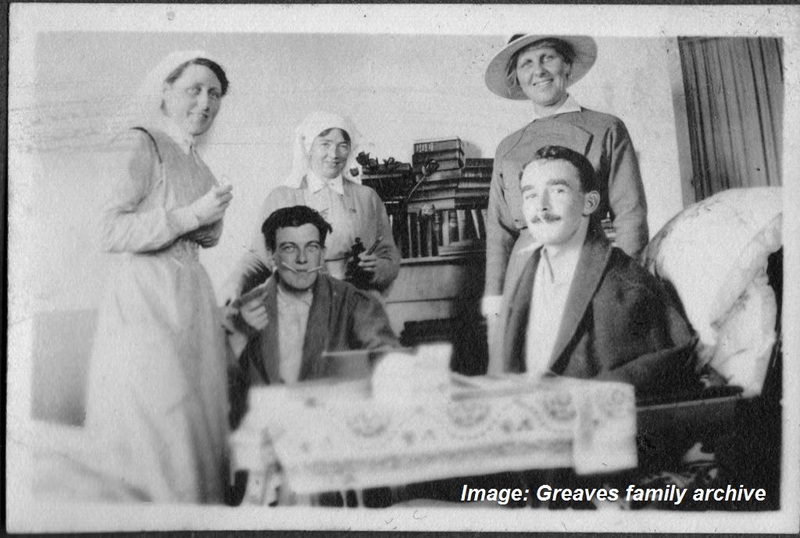 Here’s a thought – Matron Ida Greaves RRC, graduate of Newcastle Hospital NSW, joined her unit (the Australian Voluntary Hospital) in London on 19 August 1914 and was demobilised 26 March 1919 (service record in National Archives of the UK). Whilst it makes not a jot of difference to the value of her or anyone else’s military service, it is an intriguing thought. Any advance on 4 years 7 months and 7 days in uniform? 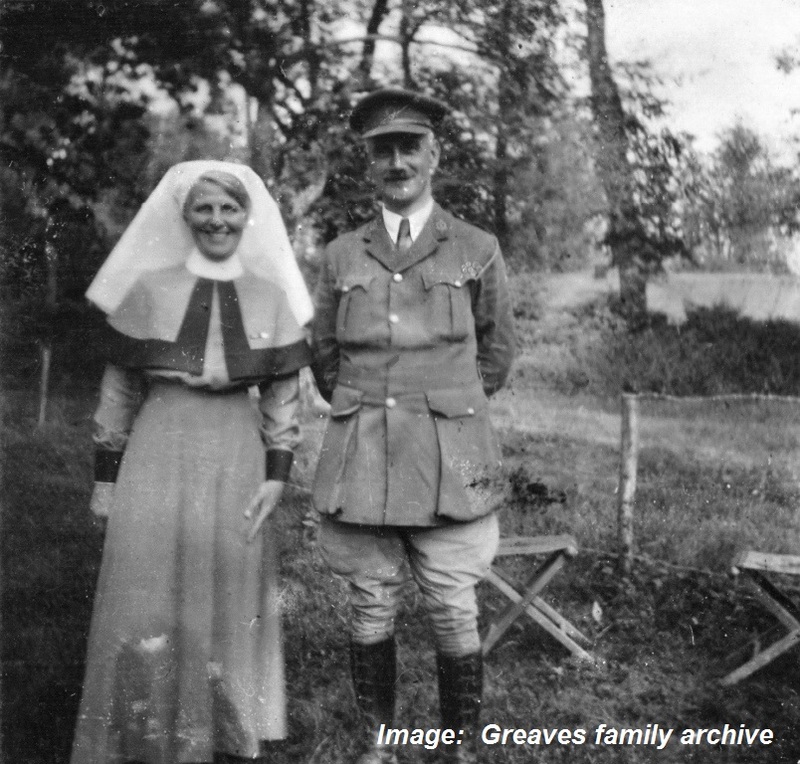 Matron Ida Greaves and an officer. Note the ribbon of the Royal Red Cross on the left side of the cape. This photo was taken at No 7 Casualty Clearing Station, Ligny St Flochel, France on 21 August 1918 when Ida had been in uniform for 4 years. Photo courtesy Greaves family archive. Click on image to enlarge. This entry was posted in Australia, Australian Voluntary Hospital, Great War - First World War - 1914-1919, Newcastle N.S.W., Royal Red Cross, Uncategorized, Women and tagged Australian Voluntary Hospital, Ida Greaves, Newcastle Hospital NSW, Royal Red Cross on 16/12/2013 by Great War Nurses from Newcastle & the Hunter Region. The first Armistice Day – “the dead are still dead and will not return”. 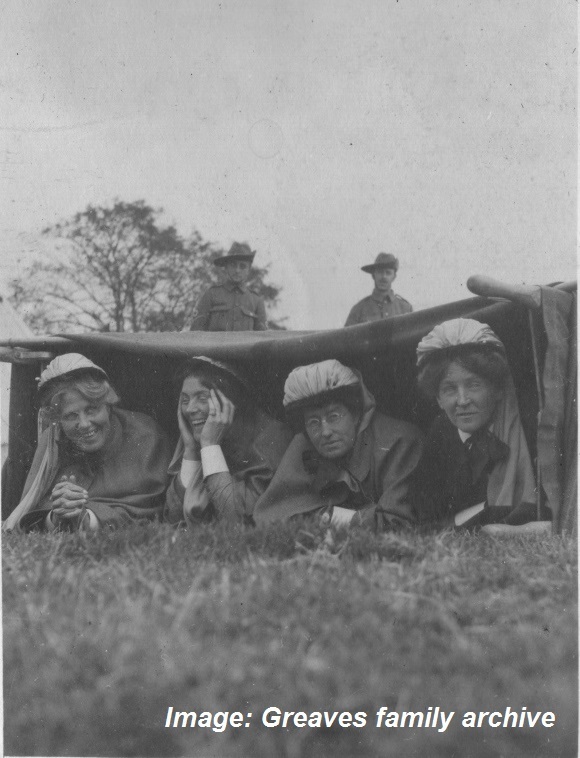 Se en through the eyes of nurses and medics, the war was far from over when the Armistice came into effect. 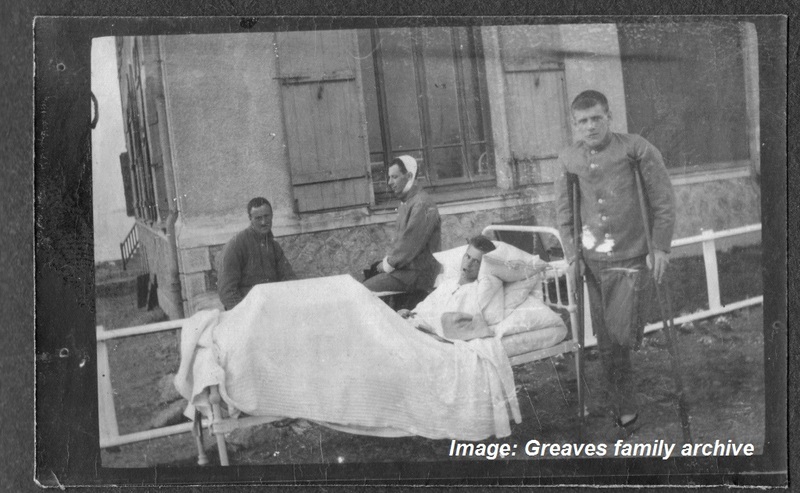 The fighting might have stopped, but efforts to care for the wounded, sick and dying continued with an added poignancy. This entry was posted in Anzac, Armistice Day, Australia, Great War - First World War - 1914-1919, History, Hunter region N.S.W., military nursing, Newcastle N.S.W., Uncategorized, Women on 11/11/2013 by Great War Nurses from Newcastle & the Hunter Region. 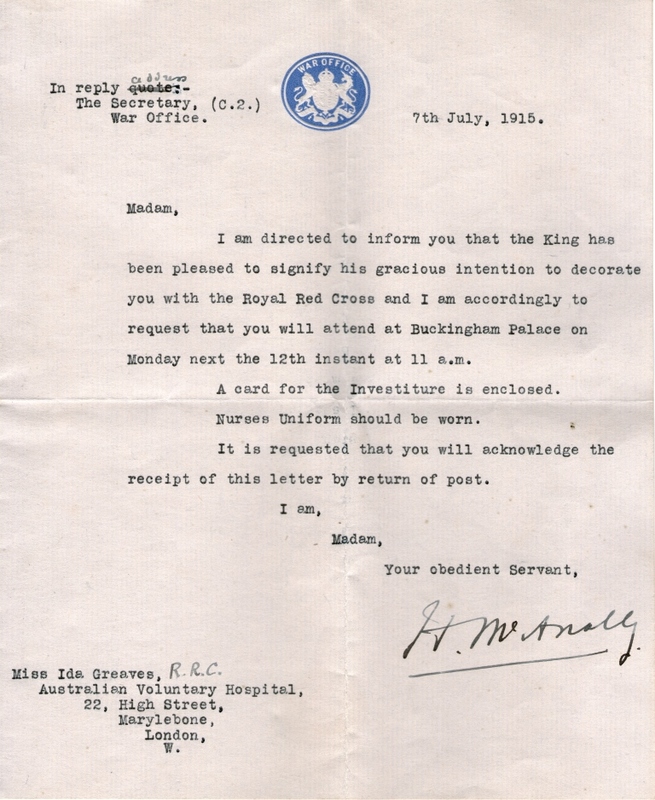 Invitation to attend presentation of the Royal Red Cross at Buckingham Palace. Reproduced courtesy Greaves family. Click on image to enlarge. 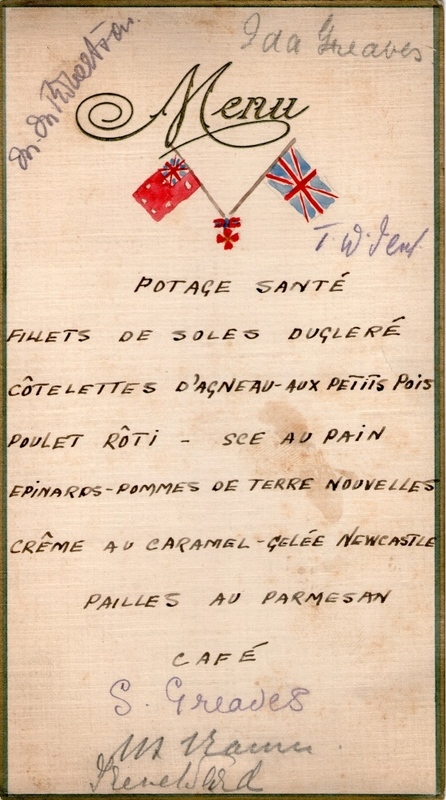 Dinner in honour of Matron Greaves’ award of the Royal Red Cross – the illustration at the top of the menu depicts the Royal Red Cross between the Australian and British flags. As a compliment to Ida one of the desserts has been named “Gelee Newcastle”. Reproduced courtesy Greaves family. Click on image to enlarge. Matron Ida Greaves and an officer. 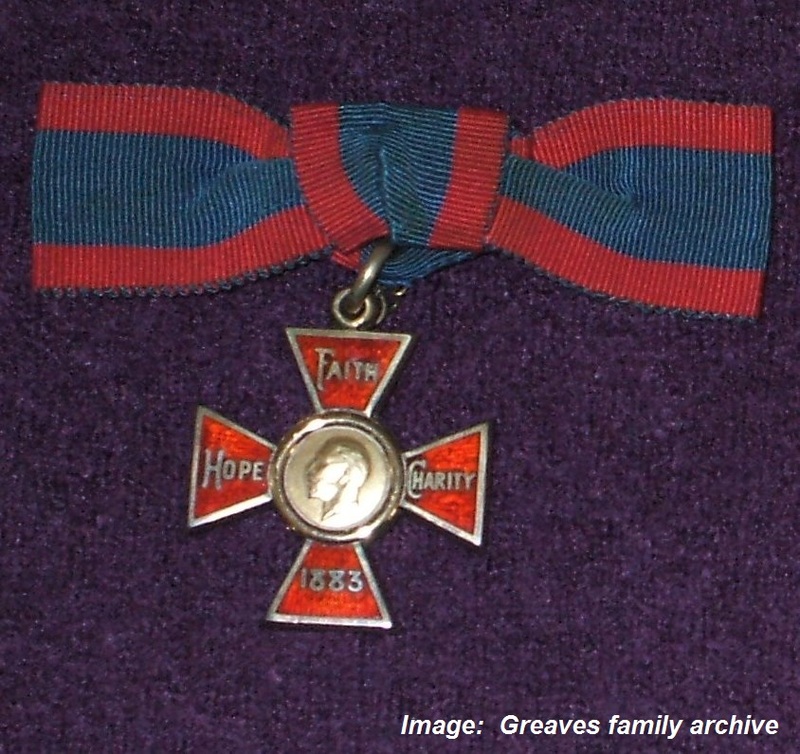 The ribbon of the Royal Red Cross can just be seen on the left side of the cape – this would have been worn for “every day” with the cross itself reserved for ceremonial occasions. This photo was taken in 1918, after the AVH had been absorbed into the Royal Army Medical Corps – Ida is wearing the uniform of the British nursing service, Queen Alexandra’s Imperial Military Nursing Service Reserve. Photo courtesy Greaves family archive. Click on image to enlarge. This entry was posted in Australia, Australian Voluntary Hospital, Awards, Family history, Great War - First World War - 1914-1919, History, Hunter region N.S.W., military nursing, Newcastle N.S.W., Royal Red Cross, Uncategorized, Women on 29/09/2013 by Great War Nurses from Newcastle & the Hunter Region. Field days practice, St Nazaire, France 1914. Matron Greaves is on the left. Image courtesy Greaves family archive. Click on image to enlarge. 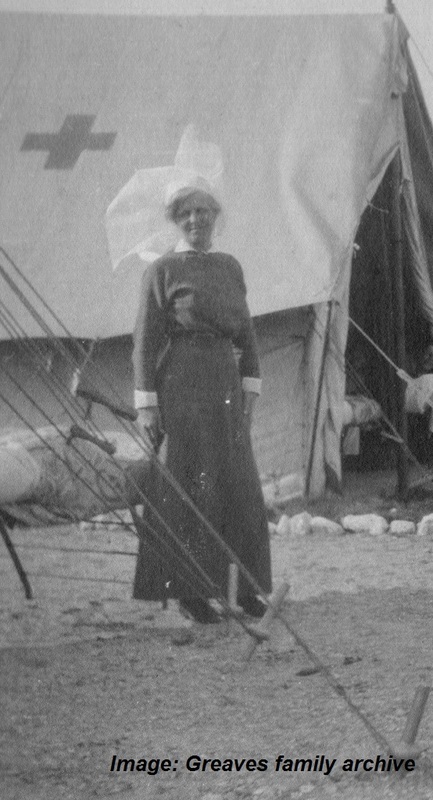 Matron Greaves at Australian Voluntary Hospital Camp, c1914-1915. Australian Voluntary Hospital c1914-1915, Matron Greaves standing at right. Patients at Australian Voluntary Hospital, c1914-1915. 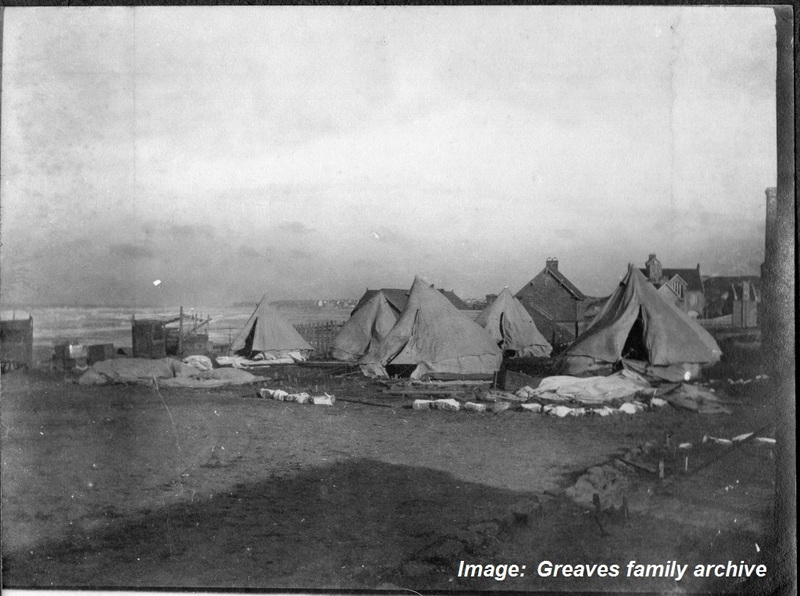 Tents after storm, Australian Voluntary Hospital, c1914-1915. This entry was posted in Australia, Australian Voluntary Hospital, Family history, Great War - First World War - 1914-1919, History, Hunter region N.S.W., military nursing, Newcastle N.S.W., Women on 17/09/2013 by Great War Nurses from Newcastle & the Hunter Region.